MAMA LEARNED HOW TO USE A SKILL SAW! Sometime in 2010, my husband said, "It'll be good for the kids. Let's get some chickens.". Afterall, he himself never raised them, although his grandparents and parents did. He just assumed that we would snag up some chickens and let them roam happily throughout our garden...with no thought of predator protection or a coop. Thank goodness one of us likes to research things! So I spent months upon months researching...we live in Texas, so I knew we would have hot weather to contend with. I read nearly every page of the "Coop Building section" here in BYC, I made notes, I came up with different design strategies, I changed dimensions, etc. Afterall, we live in a suburban neighborhood with and HOA, and yes, these chickens were illegal with a capital "I". 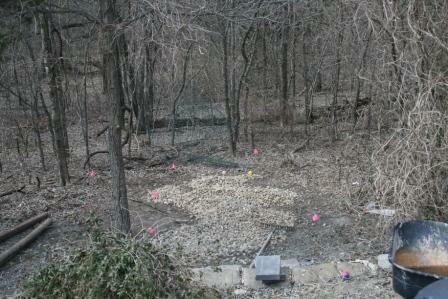 That being said, we are lucky that our property butts up against the woods....neighbors on two sides, woods behind. 100 yards from our gate, there is a nice winding creek....no one ever goes back there. We considered it our duty to be good stewards and take over that property (well, 15 ft of it to put in a coop) with good faith in mind. 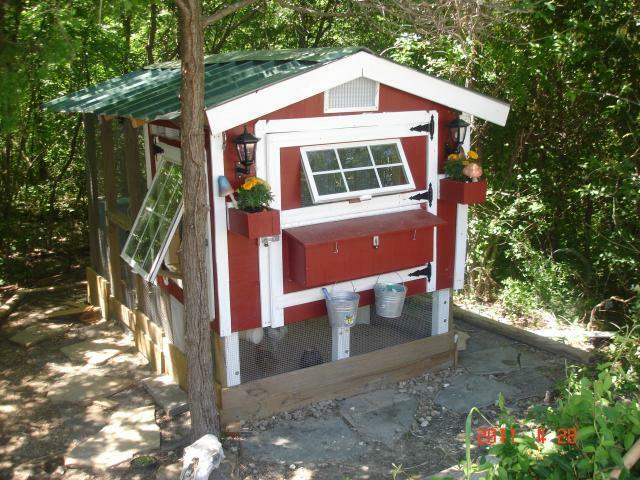 Our neighbors (with whom we are good terms) were not thrilled with the idea of the coop and kept saying that there are critters that will eat them....blah blah, YES, but I read BYC and my design, while not faultless, addressed these concerns! I think they thought it would be an ugly eyesore. My husband pretty much nodded his head at whatever I had to say (although he put his foot down concerning an 8X8 coop, citing it was just too big). Months pass. I gather up materials slowly that come our way via Habitat for Humanity, looking for the best deals (3/4" plywood, already cut into 1 x 4 ft rectangles, $1 each. Perfect for loading into a Prius) I knew that if we bought the chicks in February, we would have to start the coop in January, at least. Of course it doesn't work that way. Our girls and boys arrive February 9; all 25 bantams are happy and warm. I panick because we have not broken ground. At this point, my husband just still nods his head...he is unconcerned about the timeline. Its cold outside. But I'm not scared of work. I cut away brush; my husband gets to whip out the chainsaw and take out a few smaller trees. My husband starts working overtime. I borrow his truck; I haul 1/2 ton 1" gravel to the chicken site. But at leasts its cold. I lay leftover welded wire over the gravel and cover it with landscaping cloth.